On the 24rh of last month we scooted down to Isla Tigre. Scooted isn’t the best word. We had decided to sail outside the reefs and then cut in and head south to Tigre. We left the Holandes Cays with mild seas and enough wind to reef the mainsail heading slightly south of east. As we left I thought “rather mild conditions” so I radio’ed back to Passport and let them know. Passport was our shadow on this trip and they too wanted to visit Tigre and see the Kuna Yala Festival of their revolution. So with sails set we settled in for a nice 3 hour ride. Once outside of the protection of the Holandes Cays the seas began to build. We tow our two dinghies most everywhere in the San Blas and they were having a ball sliding down the waves behind us. The now 10-12 footer waves would slide underneath Elysium trailing a slick of foam as we slipped over and down the backsides; the dinghy’s would run off first to port as the wave approached and as it shot by they would then bang together and run off to starboard. We watched them making sure neither one broke loose. Each dinghy has two separate tow lines attached so even if one line parts we have a safety line on. However, neither line can prevent the dinghies from becoming twisted up, prevent them from turning turtle, or simply filling with water. We’ve never had one on this cruise turn turtle but we’ve had the hard dinghy fill with water and we’ve had the two dinghies twist up their tow lines. Now I keep both dinghies equal distant from the boat on a short leash and that seems to have helped keep them where they belong. While we waited for our turn south and anticipated an improved motion to the boat Passport was keeping pace behind us. They started out later and as we’re hauling two dinghies we expected them to pass us but IB chose to keep the reef in his mainsail and so they mirrored most of our moves. Turning south didn’t seem to help much. Here we had to watch closer for reefs. With these seas they show up like a moon on a clear night as the waves crash and break over them. We watched the charts, kept an eye on the GPS and stayed ever alert for the breaking seas. No matter what charts and GPS’s show, it is land that we must always avoid. If the chart shows plenty of water and the seas are breaking we listen to Neptune and avoid those specific areas. We made it around the reefs and after an hour more we’re anchored behind Isla Tigre with 3 other boats including Hobo. Hobo we met in Colon and they’re completing their circumnavigation on a powerboat having decided 90% of the way around they were not going to do any more oceans. 🙂 Once they reach Cartagena they’ve completed their circle. Larry (on Hobo) stopped by to tell us of some of the activities the following day. The anchorage was rolly, and seems to always have been when we’ve visited. This is actually the first time we’ll have been ashore although it’s the third time we’ve been here. Always in the past it’s been a transit stop. Passport (IB, Becca, and Emily – aka Legs) and us went ashore for a pre festivities scouting trip. We walked the entire length of the island from the school on the East end to the community commercial restaurant next to the not used airport on the west end. There we discovered that most huts have a solar panel, there is a large group of pigs next to one of the churches on the north end, and we found the congressional building and square where the festivities will take place tomorrow. Eight am we were up and ready. A little late as the festivities we had been told were to have started by 7:30 am but we hoped that was South American time where nothing starts at the said hour. The generator was run, refrigeration and freezer was at the optimum temp, battery for the camera was charged and we were ready. We left the dinghy at the commercial dock and wandered the 100 m to the Congresso (large bldg where they met and discuss political, economic, and social needs of the island). There a Kuna invited us to enter and we began the task of figuring out what was said without an understanding of either Kuna, or Spanish. Our Kuna guide attempted to translate what was happening into Spanish but once W/ let him know our Spanish was only slightly better then our understanding of Kuna he was satisfied to let us watch. The speeches seemed to be focusing on their conversations of seeking independence from their Panamainin overlords in the first part of the 20th century. That completed we all went out to the square and the show started. 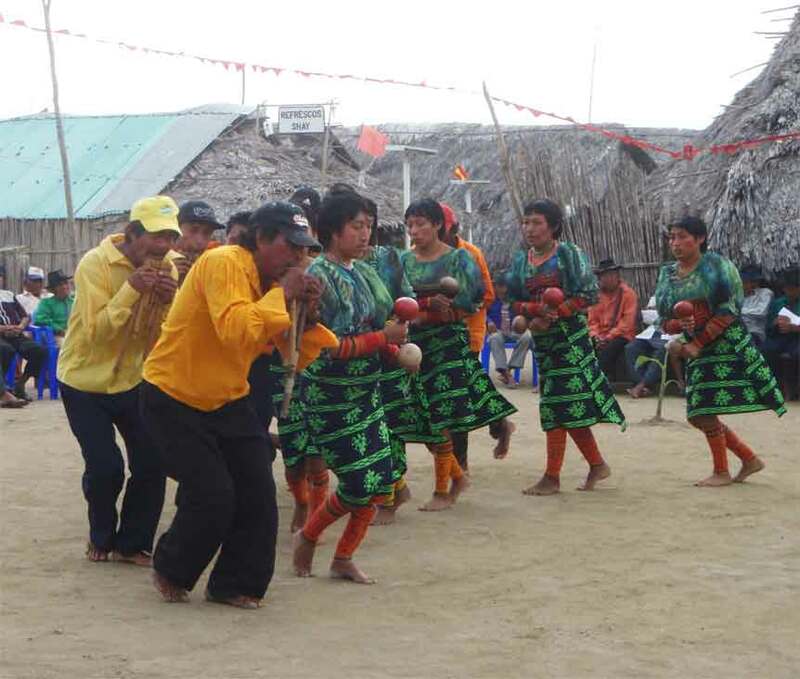 This part of the festivities was comprised of about 20 skits depicting the events that lead up to the Kuna revolution and was interspersed with their song and dance. The instruments were small Bamboo flutes tied together with cord, Gords filled with seeds, and their bare feet slapping the ground set the beat just as a percussion instrument would. The males played the flutes and the women shook the gourds. I don’t know if this is standard in all of Kuna Yala or if this is only they way this dance troupe performs. Sun). The seating arrangement reminded me of the ol’ Florida line of how you tell a Cracker (Floridian) from a Yankee (anyone not from Florida)? The Yankees in the Sun! Follow the rules or else! they prepared for the next one. There appeared to be no limits on who could participate although we were later told that all participation was voluntary. In some of the skits there were small children (under I’m estimating 5 years old) and when their father was getting beaten or their mother was having their beads cut off her legs and she was physically resisting, the child was in tears. We were told the skits had been rehearsed up to a month prior this day. But the screams, wails, and tears of a few of the children seemed quite real. Their mom and or their dad was suffering great harm. 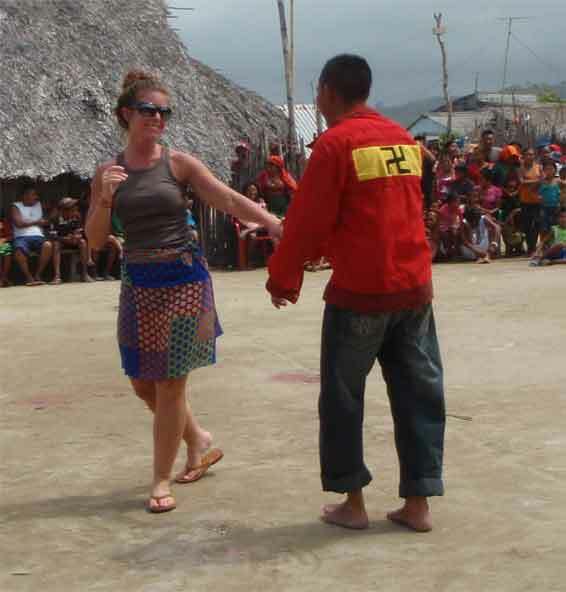 Legs (Emily) was invited to dance with a Kuna (she accepted – she’s single) and they danced to the the Beatles (yes the Beatles Group from England) music and lured 4 Panamanian officials to the party. 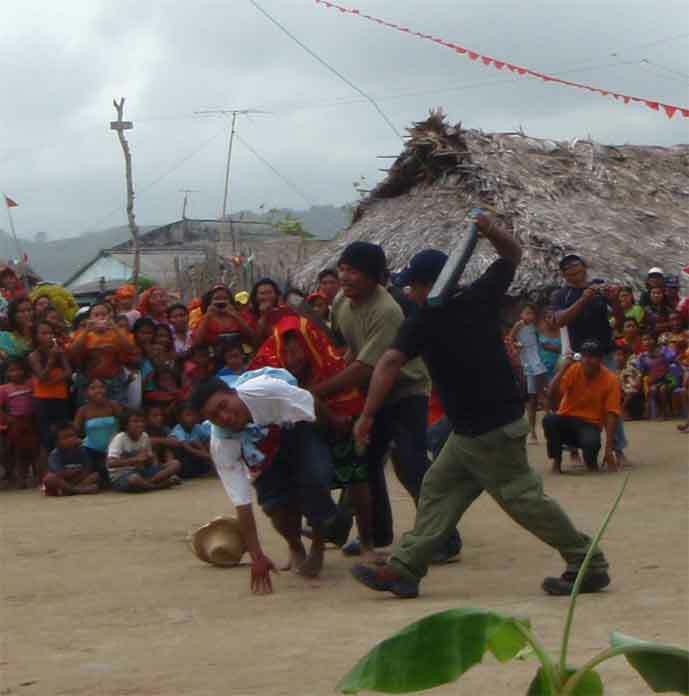 There, a dozen Kuna hid about the perimeter and when the Panamanians came to arrest the dancers they were jumped, beaten, and killed or kicked out of the territory. Last came the political speeches and by then I had had too much of not comprehending what was being said. I chose this time to stroll around the island. I found the bakery and took some more pictures. Becca (from Passport) followed and finally we were able to signal W/, IB, and Legs to leave the political speeches and we strolled back to the restaurant, had some refreshments and W/ and I a bite to eat. 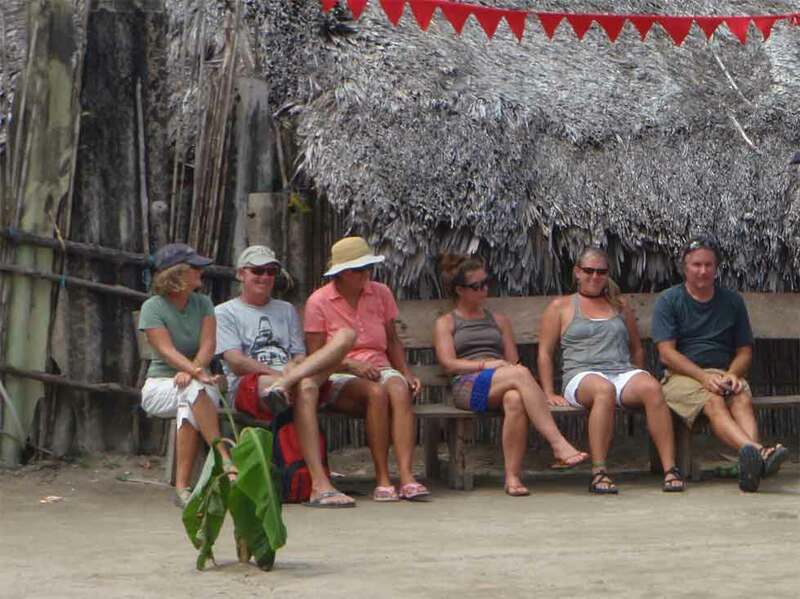 At the restaurant we met the Sila’s son (who actually worked in Bocas Del Torro, Panama) and he spoke enough English that we could ask him questions about the events and their significance. He learned English by watching movies and his English was MUCH better then our Spanish! He told us pieces of the story that we may have missed. He told us while 99% of the people of the island seemed to be at the celebration a many of them had a family member that had been directly involved in the oppression or the revolution. They could actually remember their father or mother, aunt or uncle talking about it, being beaten, or being arrested. 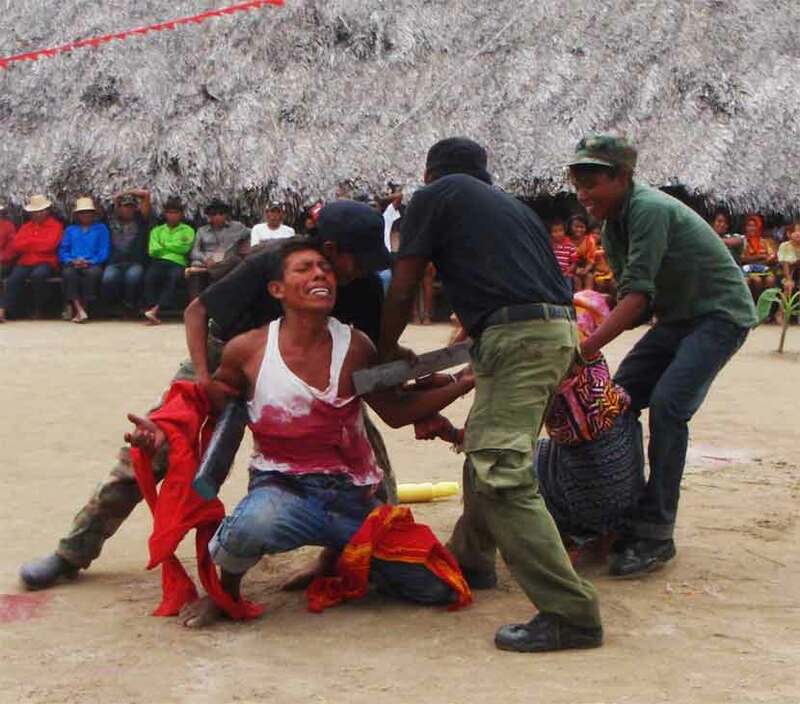 While we too celebrate our revolution on the 4th of July, no American understands the causes and results as intimately as the Kuna know the story of their own revolution and independence. Posted in Places | Comments Off on Do you want a Revolution?